This shea butter is completely raw and unrefined, leaving all of it’s natural vitamins intact. We supply our shea butter in a clear plastic food grade tub to keep it fresh. Our shea butter is cut fresh daily for every order. Our shea butter varies between grey and pale yellow in colour, and it is naturally brittle in consistency. Shea butter is very good in soaps, lotions, lip balms, body butters and moisturisers. Our shea butter is 100% organic, unrefined, natural and pure, no added ingredients, preservatives or any other nasties! The benefits to your skin of using unrefined organic shea butter don’t just stop at pure shea butter being a fantastic moisturiser. 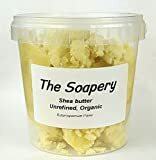 Shea butter contains high amounts of Vitamin A, which is important in improving a number of skin conditions such as blemishes, stretch marks, eczema and dermatitis. Pure organic Shea butter also contains Vitamin E, although the effect this has on the skin is less clear cut. Vitamin E has been described as having anti-aging, anti-free radical agent and having a positive effect on microcirculation within the skin. It is not entirely proven what affect the Vitamin E in shea butter has on the skin, but it could include these Only high quality pure and organic shea butter can provide the benefits metioned above. Shea butter that has aged or lost it’s natural integrity will only be an effective moisturiser, and have none of the natural health benefits; this is why we sell unrefined pure organic shea butter, so it has the highest possible amount of nutrients within it. Some of the shea butter on sale can be about 2 years old before it even reaches you! Our shea butter is guaranteed less than 9 months from the time it was harvested Pure Organic Shea butter will last about 12 months, and it is best to keep it somewhere cool, dry and sealed. Prolonged exposure to sunlight will degrade it over time.